As technology transforms what accountants can achieve in an hour, practices all over the world are experimenting with new ways to charge for their services. Here, Sammie Johannes of Accodex explains how her firm has been meeting the challenge. Accodex is an accounting technology company headquartered in Adelaide, South Australia which services Accounting and Technology Partners in Australia, the UK and USA. Our Accounting Partners offer services from bookkeeping and payroll, through to full compliance and advisory services, as well as software deployments. 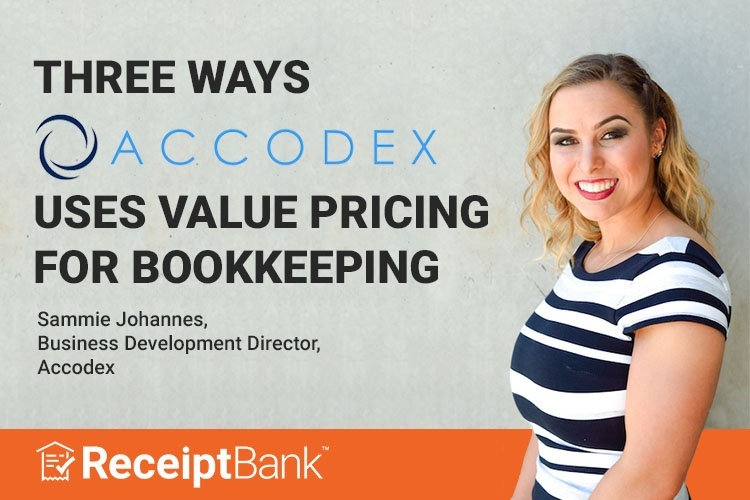 Receipt Bank has been instrumental in ensuring that Accodex Partners can add value to their clients by providing a streamlined solution to receipt and invoice management. The Receipt Bank platform has enabled our partners and their clients to reduce the amount of time they have to spend on bookkeeping each week, and ensured that they can focus on business growth. Receipt Bank also provides us with the flexibility to use value pricing so that our clients get value for money. What is value pricing? Value pricing is the process of ensuring that the product and services offered are based on the perceived value by the consumer. The most pervasive way accountants collect fees; cost per hour multiplied by the number of hours they spend working on their client’s books. The main determinant of accounting fees is transaction volume. The dollars per transaction is fairly straight-forward, we set a price and multiply it by the number of transactions processed on a monthly basis. We don’t use percentage revenue as a hard fast rule. Rather but use it in conjunction with the above mentioned methodologies, to confirm our price rationale. If there is a disparity between the this methodology and the others, it prompts us to dig a little deeper. This percentage range can be made up from either a fully in-house finance team or fully outsourced. More often than not it’s a mix somewhere in between. These methods have been happily received by both our Partners and their clients. It has ensured that all parties understand how the value of accounting services has been calculated. At the end of the day, pricing strategies are about managing expectations and providing certainty for both parties with respect to fees and scope. Sammie Johannes is the Business Development Executive at Accodex, an accounting technology company based in Adelaide, South Australia.